The political everybody has an opinion not based in fact pundit world is ablaze over a new Romney ad claiming Chrysler is planning on building a plant in China and making Jeeps there. The ad references this Bloomberg article, from October 22nd, which reports Fiat, the majority shareholder in Chrysler, wants to move some production to China. Government Finally Shows What We Already Know - Shipping Jobs Overseas is a Big Problem! The BEA is finally giving us some interesting data in this BEA economic release, Summary Estimates for Multinational Companies: Employment, Sales, and Capital Expenditures for 2009. Their statistics show U.S. multinationals fired more Americans than those abroad during this recession, even while some of these companies were bailed out by U.S. taxpayers. 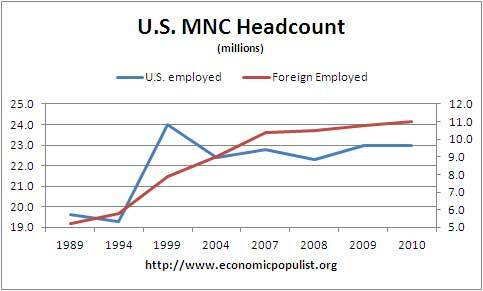 Additionally, these same corporations clearly have been offshore outsourcing jobs over the last decade. Read more about Government Finally Shows What We Already Know - Shipping Jobs Overseas is a Big Problem! It all Depends on what you call "Small Business"
Surfing the Internets I found a most interesting post by Chris Gunn, SBA continues to fabricate contracting data. Oh really? It seems the Small Business administration likes to re-categorize large multinational corporations as Mom & Pop operations in order to award them large amounts of government dough! This year the SBA awarded $93.3 billion to Small Business in 2008. It appears the SBA also missed it's target in small business contract awards by a good 1.5% (ignoring the awarding of contracts to those not qualified). The numbers are significantly inflated with some of the largest corporations in the world. In some cases the numbers even appear to be the result of fabrication by high-level government officials at the SBA and other government agencies. Read more about It all Depends on what you call "Small Business"